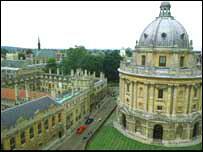 In a proposed reorganisation of Oxford's world famous libraries the university has dismissed suggestions that the Radcliffe Camera is to be turned into a visitor centre. The proposals centre on the forty libraries run by the central university and not those run by individual departments or colleges, and would integrate and make them more accessible to staff, students and overseas scholars. Some small specialist libraries would close and books would be moved to other locations, including a new repository at Osney Mead on the outskirts of the city, where books would be retrieved by robotic procedures after being ordered online. Reports that dons fear the university's distinctive Radcliffe Camera - a domed circular library opened in 1749 - could be turned into a visitors' centre were dismissed by Oxford University officials who said that no decision has yet been made concerning its future use. 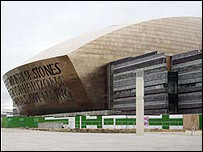 Wales' first national poet has been named as Gwyneth Lewis, who wrote the inscription at the front of the Millennium Centre in Cardiff. While Wales has a long poetic tradition largely centre around the chairing and crowning of poets at the National Eisteddfod, her role will be the first to serve Wales nationally and through both languages. Her work encompasses both English and Welsh poetry and non-fiction writing, with a new book out next week. She has written six books of poetry in Welsh and English, and two non-fiction works. The Harry Ransom Humanities Research Centre at the University of Texas has bought Norman Mailer's archive of manuscripts, letters and books. Contained in more than 900 boxes, the archive includes more than 10,000 letters as well as unpublished stories, essays and notes. The university will take charge of the material in July. The conservation and cataloguing of all the documents is expected to take several years. Mailer won the Pulitzer Prize twice - for The Armies of the Night in 1968 and The Executioner's Song in 1979. Dornford Yates (real name Cecil William Mercer) was born in 1885 at Walmer, Kent, the son of a solicitor, and attended Harrow School and University College, Oxford. His degree was not good enough to gain traditional access to the bar, probably because he spent a lot his time there involved with the Oxford University Dramatic Society. His father used a little known 'back door' to the bar and in 1908 he became a pupil to a prominent solicitor, H. G. Muskett, who appeared on behalf of the Police Commissioner. As his pupil, Yates saw a great deal of the seedier side of London life at Bow Street court. Yates was called to the bar in 1909. As a junior barrister he was not often overburdened with briefs and for several years wrote short stories in his spare time. His first known story appeared unattributed in Punch in 1910 and he wasn’t given the credit until the publication of the index to the half-year volume. From 1911 his stories were published in the popular Ward Lock monthly ‘Windsor Magazine’ and a collection was published in 1914 as his first book, ‘The Brother of Daphne’. His output includes two distinct series of books, the light and amusing ‘Berry’ books and the ‘Chandos’ thrillers as well as a number of non-series titles. His main characters are drawn from the gentry class who have the freedom to pursue leisure or villains (depending on the genre) at will. His style of writing is picturesque, a touch old fashioned perhaps using some archaic forms but losing nothing by that as it is still a pleasure to read well-written English. The general atmosphere created by Yates’s light fiction is one where every day is summer and England is green, peaceful and welcoming. His novels are populated by 'ladies' and 'gentlemen' who are worshipped by their servants who, in turn, are regarded as part of the family but a very definitely hierarchical family. The class system, in which he was a sincere believer, is very evident throughout all his books and a later title, ‘Lower than Vermin’ (1950) regrets its passing and yearns for older days. Yates’s thrillers tend to grip from the outset. His heroes are based in England but the main action generally takes place in continental Europe. They will rarely consider travelling without taking a pistol although they have little need for passports. Their cars have running boards, starting handles and a secret compartment for the armoury. Right always prevails, the natural order of things is eventually restored and villains are ‘put-down’ without any qualms. His second book, ‘The Courts of Idleness’ was published in 1920, again a collection of short stories first published in the Windsor magazine. In these stories he had created the Pleydell family, the senior member being ‘Berry’ and his next book, ‘Berry and Co.’, also in 1920, further established the genre. By this time he had moved to Pau in south-west France and in 1921 came a change of tempo with ‘Anthony Lyveden’, a gothic romance (as was the sequel ‘Valerie French’ in 1923). 1922 saw a further ‘Berry’ book with the publication of ‘Jonah and Co.’, followed by two volumes of short stories, ‘And Five were Foolish’ (1924) and ‘As Other men Are’ (1925) and a fantasy, ‘The Stolen March’, in 1926. A further change of style came in 1927 with his first ‘Chandos’ thriller, ‘Blind Corner’, published by Hodder and Stoughton. Hodder was to publish a further seven titles including one cross-over genre, ‘Adele and Co.’ (1931) which is a ‘Berry’ book with thriller elements. The publishing rights to these eight titles were later bought by Ward Lock who reprinted them from 1943 under their imprint using the original Hodder plates. Yates has been criticised for his ‘anti-Semitic’ views and even called a ‘Nazi’ by some. The basis appears to be his use of apparently Jewish villains, especially in his thrillers, but any author will use his experience and observation on which to build his characters. At the time of his pupilship with H. G. Muskett, a major section of the criminal underworld appearing before the court was of Jewish extraction, and so Yates was only writing about what he knew. That the facts were out-of-date was unfortunate but he was now resident outside England and so rather out of touch with contemporary crime. Eight more books appeared in the Ward Lock imprint before 'The House that Berry Built'. It is based on the real building project (right) he undertook at Eaux Bonnes, near Pau, the house 'Gracedieu' of the book being in reality called 'Cockade'. 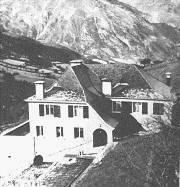 The house was completed in 1939 but the war delayed publication of the book until 1945. With the invasion of France in 1940 the Yates closed up the house and travelled to Salisbury, Rhodesia. As the war drew to a close he returned to ‘Cockade’ but was disappointed in both the state of the house and the attitude of the French and after some months he returned to Umtali, Rhodesia where Yates was to spend the rest of his life. He continued writing and produced two further ‘Chandos’ thrillers, ‘Red in the Morning’ (1946) and ‘Cost Price’ (1949), a further ‘Berry’ book ‘The Berry Scene’ (1947), which filled in some of the gaps in previous narratives, as well as two quasi-autobiographies and three other novels. 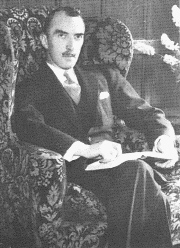 Dornford Yates was one of Ward Lock’s most popular and successful novelists of the first half of the 20th Century, to the extent that he was invited to contribute the preface to Edward Liveing’s history of the publishing house ‘Adventure in Publishing’ (1954). He died in March, 1960 and was buried in Umtali. Of Yates’s total output of 34 books ten were ‘Berry’ books, eight were in the ‘Chandos’ series (narrated by Richard Chandos) and there were five non-Chandos thrillers, although in 'Gale Warning' (1939) Chandos is one of the characters but not the narrator. His books are still collected and some editions are quite scarce. The later uniform edition, published in the 1950’s with armorial design dustjackets by Val Biro is a popular way of gathering an almost complete set of his work as only his final title did not appear in that edition. The earlier editions with pictorial dustjackets make a more attractive collection. Very early copies used artwork based on the original Windsor Magazine illustrations but they are quite scarce. J. Morton Sale produced some ethereal illustrations for the Hodder and Stoughton titles and Ward Lock dustjacket illustrators include van Abbé in the 1920’s and J. F. Campbell in the 1930’s. Titles with these jackets can still be found fairly easily although those in very good condition will command a premium. For further reading, Richard Usborne wrote a comparison of the works of Dornford Yates, 'Sapper' and John Buchan in 'Clubland Heroes', published by Hutchinson in 1953 and A. J. Smithers a biography of Dornford Yates, published by Hodder and Stoughton in 1982. There is a further book associated with Dornford Yates. 'What I Know' by C. W. Stamper was published in 1913, a volume of memoirs by the chauffeur/mechanic to Edward VII, 1905-10. In the author's foreword there is note of thanks to Dornford Yates, 'but for whose tireless assistance these memories might never have been written'. The style of writing is very much in the Yates' vein and it is assumed that he had ghost written the book. A. J. Smithers, referring to Pau in his biography of Dornford Yates states "exactly how he hit upon the place is not clear" but visits to the French town of Pau figure several times in these memoirs. It may well be the answer that having discovered this Yates decided that anywhere good enough for King Edward VII was probably good enough for him! "....a market town in the Brecon Beacons National Park. It has 1,500 people and 39 bookshops. The Festival is a spectacular holiday party and an opportunity to indulge your tastes for the finest books, food, comedy, music, gardens, art argument, conversation and literature. The ideas and stories flow freely." ...none of which we would argue with except, perhaps, the number of bookshops as number 40 (? ), ibooknet members O'Donoghue & Dworski, at 2 Backfold, is the latest addition to look out for. The winners of both prizes will be announced at an award ceremony in Portman Square, London, on 7th June 2005.